Trunks: Dense shrubs, erect, usually much-branched. Stem segments green to grayish green, straight to curved, cylindric or clavate, .8 to 20 inches long, .6 to 1.6 inch wide, prominently tuberculate; areoles elliptic, wool yellow, tan, or gray; spines 5-30 per areole, red, tan or brown, spreading, straight or slightly curved, barbed, .3 to 1.2 inch; glochids usually numerous among larger spines. Leaves: Leaves cylindric or narrowly conic, succulent, soon deciduous. Flowers: Borne on new segments, rotate, 1.2 to 2 inches; outer tepals green; inner tepals red to magenta, yellow, or yellowish green; anthers yellow; style pale green proximally, pink or red distally; stigma lobes green or cream-colored. Fruit: Yellow, cylindric-obovoid, 1 to 1.8 inch long, .8 to 1.6 inch wide, fleshy, spineless; seeds yellow or tan, nearly circular to angled, warped, 1/10 to 1/6 inch diam., smooth or lumpy. Habitat: Sandy to gravelly shortgrass, mixed-grass, and sandsage prairie. Uses: Native Americans consumed the fruits raw or stewed, or dried them for winter food. A number of tribes roasted and ate the young stem segments. The spines were sometimes used as sewing needles and for tattooing. Comments: Kansas plants belong to var. imbricata, the widespread variety in the southwestern Great Plains and southern Rocky Mountains. 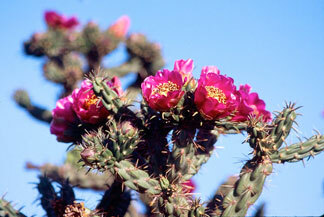 Tree cholla probably is native in Kansas only in the Cimarron River and possibly the Arkansas River valleys. Plants in central and northern Kansas probably are the result of moving livestock.